US Supreme Court justices tiptoed around the offensive F-word at the centre of a free speech case as they considered a challenge to a federal law that restricts trademarks on "immoral" and "scandalous" words and symbols. The F-word word in question, which government lawyer Malcolm Stewart described as "the paradigmatic profane word in our culture," was not uttered openly in the famously decorous courtroom. Several justices signaled reservations about striking down the provision in US trademark law, which has been on the books for more than a century. 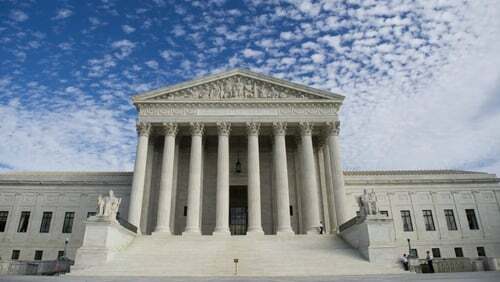 But other justices indicated that the law is written so broadly that it violates free speech protections under the US Constitution's First Amendment. The court could well follow the course it took in 2017 when it struck down a similar law forbidding the registration of "disparaging" trademarks in case involving an Asian-American dance rock band called The Slants, a name trademark officials deemed offensive to Asians. Justice Elena Kagan said the argument by President Donald Trump's administration in defence of the law appeared to be based largely on a commitment that the government would ban only trademarks featuring the most offensive words. Justice Neil Gorsuch followed a similar line of questioning, wondering whether the US Patent and Trademark Office's decisions on which trademarks to grant that feature offensive words are based on "the flip of a coin." A Washington-based federal appeals court ruled in Brunetti's favour in 2017. The Trump administration appealed that ruling to the conservative-majority Supreme Court, arguing that striking down that provision would unleash a torrent of extreme words and sexually graphic images on the marketplace. When the US Court of Appeals for the Federal Circuit, which specialises in intellectual property, ruled in Brunetti's favour in 2017, it acknowledged that it was "not eager" to see vulgar trademarks proliferate. But it criticised the US government's attempts to police them and said the law has been applied unevenly.